While it's a bit off the beaten path for most holidaymakers in France, St-Rémy de Provence is among the most attractive and interesting towns in Provence, and is well worth the 12 mile (19km) journey from Avignon. The city centre has many beautiful buildings, including the Chapelle Notre-Dame de Pitié and the Hôtel Estrine. Aside from the attractive town itself, St-Rémy is surrounded by beautiful countryside, which inspired many paintings by Vincent van Gogh. 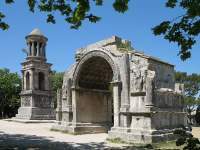 The artist lived in St-Rémy de Provence for a time, and the city has the somewhat dubious honour of being the place where he famously cut off his ear, after which he committed himself to the Monastère de St-Paul-de-Mausolée, an asylum that now offers visitors walking tours. Vincent van Gogh is not the only famous resident of St-Rémy, however, as the city was also the birthplace of 16-century author Nostradamus, famous for his predictions for the future, and was the favourite residence of Princess Caroline of Monaco for a time. Visitors will fall in love with this perfect example of sleepy small-town France, with its busy markets and quiet atmosphere. Near the city, the remains of a Gallo-Roman settlement from the 2nd century BC can be found and are also worth a visit.